1500 voting centers in Haiti opened on Sunday, giving the beleaguered population the opportunity to choose between pop star Michel Martelly and former First Lady Mirlande Manigat for president. Preliminary results are expected on March 31 and final certification on April 16 by the Provisional Electoral Council (CEP). To their credit, both candidates agreed to confine the election process to the ballot box and agreed to ban rallies and declarations of victory or defeat until after the final count, Haiti Libre reports. Both presidential candidates, Michel Martelly and Mirlande Manigat, have met the CEP and signed a code of conduct in which they undertake to respect the electoral law... after having threatened [both candidates], in recent weeks, to send their supporters into the streets the day of elections or the day after. The President of the CEP, insisted on the fact that "the respect of the electoral law is the best guarantee of the success of these elections." For Haiti, it might not matter who wins, but how the new president will address the mammoth challenges facing a nation that suffered a devastating earthquake 14 months ago on January 12, 2010. Haiti is no Japan. As the poorest country in the western hemisphere, there were little resources, leadership, or infrastructure in place to address the aftermath of the catastrophe. Whether Manigat or Martelly is up to the task remains to be seen. Water, sanitation, a cholera epidemic, housing for the displaced, an economy devastated by years of foreign trade policies that all but destroyed Haitian agriculture, and a foreign occupational force disguised as a United Nations humanitarian effort are on the "to do" list. The International Organization for Migration (OIM) utilized the United Nations Office for the Coordination of Humanitarian Affairs' (OCHA) mailing list last week to release a housing report that, if not addressed, promises dire consequences. IOM, or as it was first known, the Provisional Intergovernmental Committee for the Movement of Migrants from Europe (PICMME), was established in 1951 during the population displacement of Western Europe following the Second World War. 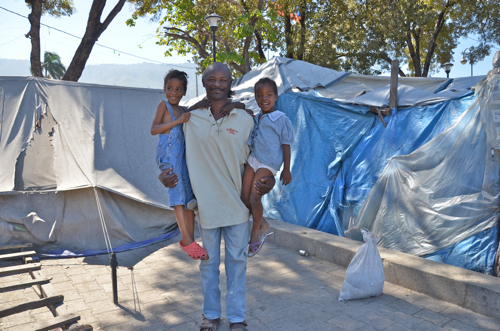 The bottom line is that half a million Haitians will be living in "tent" (tarp) cities at least through 2012. The emphasis on tarps is mine. 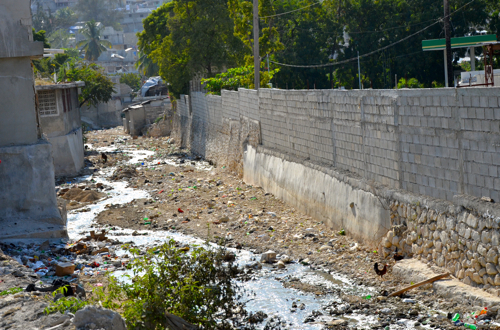 After five visits to Haiti since January 2010, there has been little relief in evidence for those living under tattered tarps, frying in the sun, drowning in the rain, and drinking non-potable water. Although the number of Haitians living in camps appears to have fallen to 680,00, down from a high of 1.5 million in the earthquake aftermath, the lower number does not tell the whole story. Statistics may not exactly lie, but in this case the numbers are an obfuscation of reality. Those who have fled the camp crime, including the euphemistically labeled "gender-based violence" (think brutal rapes), filth, and leaking tarps have moved to housing that is no better. Some have taken over abandoned housing in damaged shantytowns, set up tents on rubble-strewn family property, or gone to live with relatives. Meanwhile, cholera is set to make a return with the coming rainy season, and basic infrastructure needs of clean water and sanitation remain unaddressed. Already vulnerable families face eviction from landowners who have seen property values increase due to scarcity of buildable land. Preliminary findings from a sample survey of 1,033 heads of households who have left IDP sites over the past months indicate that about 50 percent of them have moved from camp settings to precarious housing situations. 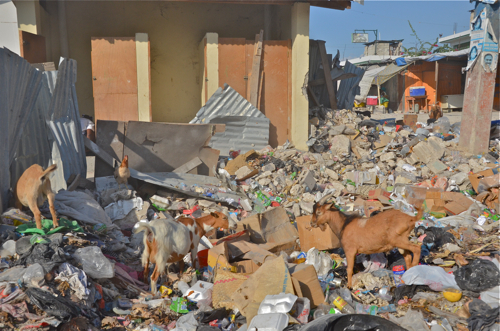 The IOM press release notes that Haitians who were made homeless by the January 12, 2010, earthquake are leaving the displacement camps in growing numbers to face an uncertain future. The reasons behind the continued departure from camps are multiple. They range from people moving into transitional shelters and durable houses, to rising evictions, insecurity, deteriorating sanitary conditions and declining services in camps according to a joint statement by the International Organization for Migration and the United Nations in Haiti. Then there is the fate of renters, and the future looks bleak. There are hundreds of thousands of former renters living under tarps in camps with few or no services, and an average of 392 people share each latrine. You know by the stench in the air when you are approaching a camp. 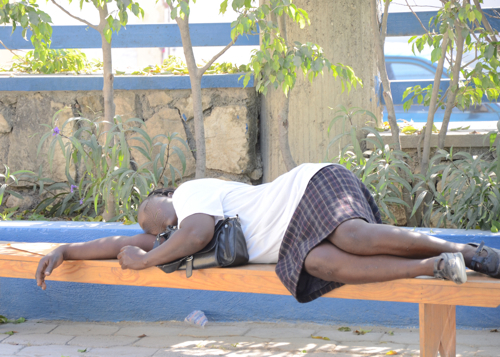 In February, IPS News reported that Haiti's current resettlement plan excludes up to 200,000 families. The stress is on "families" and not individuals. Do the math. With authorities bickering, with no high-rise in sight, and with construction and reconstruction only planned for the homeowners, 13 months later, Haiti's poorest earthquake victims are left exactly where they were on Jan. 13, 2010 - in tents and under tarps, living in subhuman conditions, under constant threat of eviction, facing a depleted housing stock with no savings. Sanon Renel, of the Housing Reflection and Action Force coalition (Fòs Refleksyon ak Aksyon sou Koze Kay - FRAKKA), which is working with unions and other groups on the housing issue, is quoted as being "outraged." "This is pure and simple exclusion. You could even call this an official policy of apartheid," Renel told IPS. Haiti may have been bumped from the headlines as current news cycles emphasize the Middle East and Japan, but the situation is no less dire than it was in January 2010, and it may be getting worse. This video by Citizen Haiti is in Creole, but the visual is worth a thousand English words. Please take the time to watch and learn. The new president of Haiti would be well advised to read the full report. Housing, like clean water, is a human right -- and both are in short supply despite the demand. Perhaps both candidates, Martelly and Manigat, should meet and discuss this issue while Haiti awaits the election results. Whoever wins will need as much help, cooperation, and advice as she/he can muster.